To make your "Favorite Teams Jersey" or any other T-shirt cake, bake the Carrot-Walnut Cake or any other cake as directed. Try this classic cake recipe, and you’ll make it a permanent addition to your collection! Heat oven to 350 F. Grease and flour bottom and sides of rectangular pan, 13x9x2 inches. Mix sugar, oil and eggs in large bowl until blended; beat with spoon 1 minute. 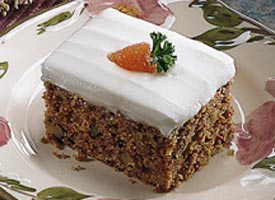 Stir in remaining ingredients except carrots, walnuts and Cream Cheese Frosting; beat with spoon 1 minute. Stir in carrots and nuts. Pour into pan. Bake 45 minutes or until toothpick inserted in center comes out clean. Cool the cake on a rectangular wire rack 10 minutes. Cover 1 rack with a towel; place rack, towel side down, on top of cake; turn over as a unit. Remove pan. Place a rack on bottom of cake; turn over both racks so the cake is right side up. Cool completely. Beat cream cheese, milk and vanilla in medium bowl with electric mixer on low speed until smooth. Gradually beat in powdered sugar, 1 cup at a time, until smooth and spreadable. Cut cake as shown in diagram. To frost the cake with ease, freeze the cut cake pieces for about an hour. Arrange cake pieces on tray to form jersey as shown. Tint the frosting with food color to look like the color of the jersey of the team you want to win. Frost the cake, then complete the jersey with trim (in the appropriate color), number and name of your favorite player. For a real conversation piece, copy and enlarge a picture of a favorite player's face, using a copy machine, and glue it onto cardboard. Cut the cardboard around the face. Glue two wooden chopsticks or skewers to the back, leaving half of each stick exposed. Poke the sticks into the center of the cake at the neck to really look like the player! Go nuts! Use pecans, almonds or hazelnuts instead of walnuts.